Take advantage of our wonderful spa packages designed to help you leave your hectic life at the door and lose yourself in a world of relaxation and well-being. Packages also make the perfect gift for someone special. 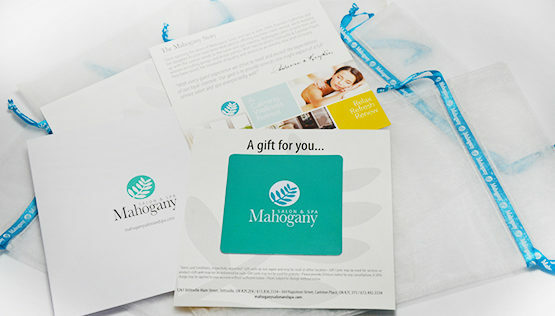 Massages included in any of our packages are performed by Mahogany Aestheticians. Regrettably, we are unable to substitute services within our packages. *Listed prices are per person. Includes a light lunch, Sea Salt Glow, 45 min Relaxation massage, Le Grand Classique Facial, Spa Pedicure, Spa or Shellac Manicure, Women’s Wash & Style and Makeup Application. Includes a light lunch, Hydralessence Facial, Spa Pedicure, Spa or Shellac Manicure and a Women’s Wash & Style. Includes a MoroccanOil Body Treatment, MoroccanOil Hot Stone Pedicure and a Spa or Shellac Manicure. Includes a Chromotherapy Bath Treatment, Mudd Wrap, Beauty Break Facial and a Women’s Wash & Style. Includes a Shellac or Spa Manicure, Classic Pedicure and a Women’s Wash & Style.